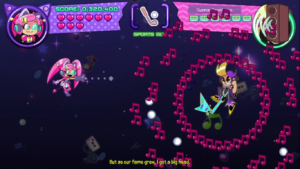 Revenge of the Mutant Camels meets Power Puff Girls in Cat Girl Without Salad developed by WayForward Technologies and released in 2016 as a Humble Bundle Original for the Windows 10 operating system platform. The game was originally an April Fools joke announced in 2013 billed as a game spanning all genres in one title. 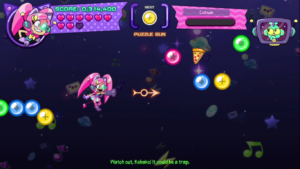 While my experiences with it thus far have revealed it to be primarily a horizontal side-scrolling shooter, Cat Girl Without Salad parodies familiar game elements from other video games integrated throughout its gameplay. 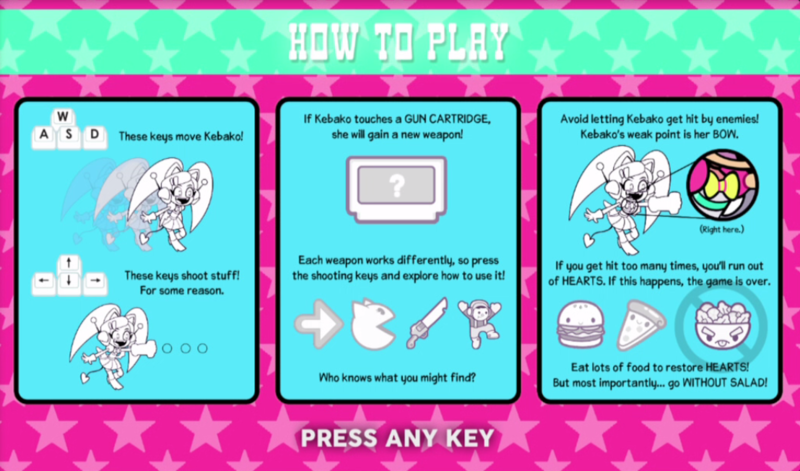 The protagonist hero of Cat Girl Without Salad is named Kebako. She is a robotic, ditsy cartoon girl bounty hunter with cat ears flying through space to fight enemies and take down bad guys. She is equipped with a default pea shooter that literally shoots peas. Throughout the game, the player will find what look like game cartridges that upgrade Kebako’s weapons in various ways. Each weapon upgrade is unique, creative, and sometimes annoying. There is a platformer gun that shoots a cartoon platformer sprite who jumps on the enemies to kill them. The sports gun shoots golf balls at the enemies based on the direction of the player’s swing. 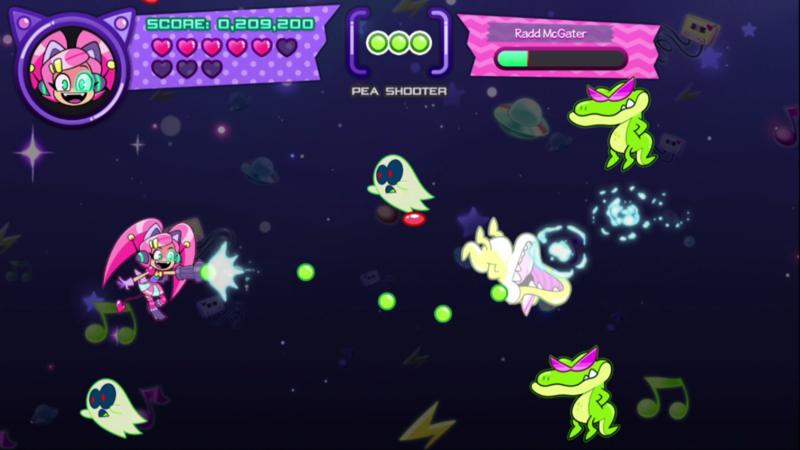 A puzzle gun turns the side-scrolling shooter environment into a scrolling game of Bust-a-Move. An RPG gun opens up a fight menu similar to those encountered in Final Fantasy games where the player can choose to attack or use magic against approaching enemies. I also encountered a dance gun that mimicks the Dance Dance Revolution games made by Konami. 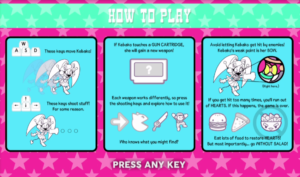 Instructions for how to play Cat Girl Without Salad are simple and provided to the player at the beginning of a new game. Guns can be fired using any of the four direction arrow keys on the keyboard. 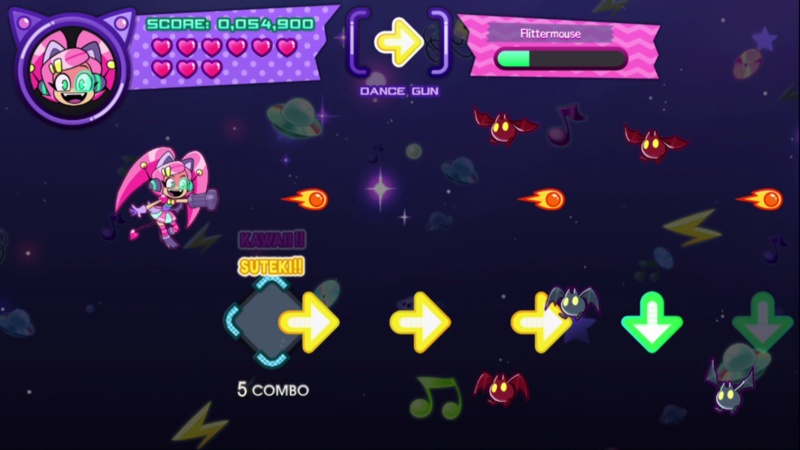 When using the dance gun, if the player times their shots appropriately with the “dance” arrows scrolling across the screen, they can achieve a combo score for each time they time their shot correctly. Ice cream sundaes, pizza, cheeseburgers, and any other junk foods may be collected to restore health, but not salads. 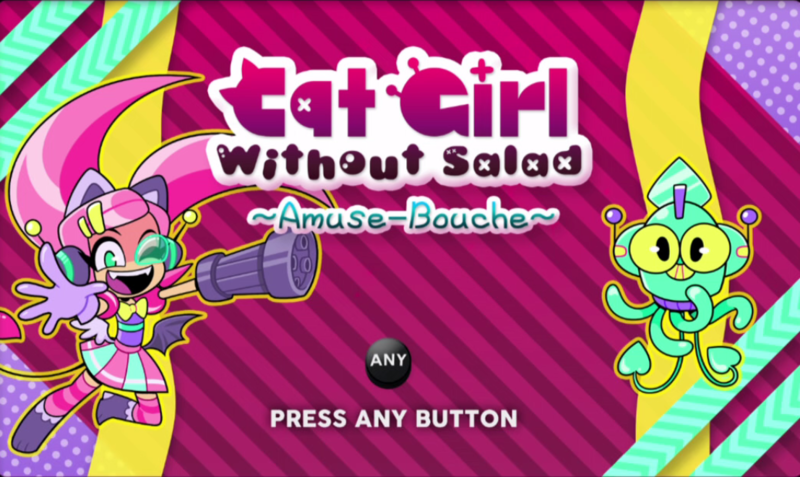 Suffice it to say, Cat Girl Without Salad is a crazy game. 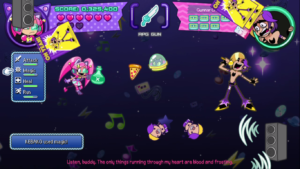 The game characters seem to act like characters from animated television shows aired on Cartoon Network or Nickelodeon to preteen girls. This somehow seems to actually add to its charm. The blasts of bubblegum pink and strobing pastels excite rather than frustrate. Whereas many such cartoons tend to grate on my nerves, the audio in Cat Girl Without Salad is thus far enjoyable. The development team seems to have really known what they were doing and enjoyed doing it. Am I playing Bust-a-Move or R-Type? 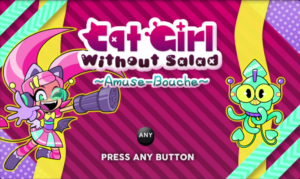 For appearing to be geared toward younger girls, whether in fact or as a joke, Cat Girl Without Salad is a legitimately challenging game. It is far from the hardest side-scrolling shooter I have played, but it’s certainly not easy either. The game feels fair, challenging, and the controls are solid. While the weapon types are clever and creative, they are not immediately useful without adequate practice. Expect to play even the first level over again to learn how to get it right. As I said, Cat Girl Without Salad is a Humble Bundle Original. This means it was made as an exclusive title for those who subscribe to the Humble Bundle Monthly service. When subscribed, it may be downloaded DRM-free to the subscriber’s local machine and launched from a simple executable. If Humble Bundle were to ever no longer be a thing, I could imagine this game would become a rare but coveted title, perhaps like Chex Quest is now. Let the reader note that after I wrote this article, I saw that Humble Bundle will be removing this game from its Humble Bundle Monthly offering on February 2, 2018. If you’re a Humble Bundle Monthly subscriber, you’ll need to get it before then to play it as part of that packaged deal. Hopefully it will still be available to be purchased in some way after February 2, 2018. The more I play Cat Girl Without Salad, the more I really like it. 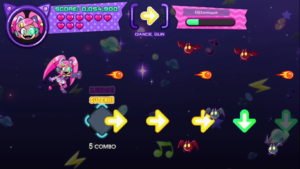 It is an addictive side-scrolling shooter that takes the genre to places that are completely different from where its ever been while keeping the core elements familiar, but fresh. If you sign up for a Humble Bundle Monthly subscription, make sure you check out Cat Girl Without Salad.